The movie starts with an interesting scene of Margaret White (Moore) that gives you the sense of how Margaret sanity truly is when he daughter Carrie is born. We fast forward and see Carrie (Moretz) as a teenager in high school. She’s shy, unpopular, a social outcast, and a bit naïve of her body. When Carrie has her period in the school shower she’s truly concerned with what’s happening with her body, even to the point where she thinks she’s bleeding to death. Of course instead of helping, the other girls lead by our main bully Chris (Doubleday) laugh at her and record her pain. It’s at that moment when we start to notice Carrie has something special about her. It’s also here when we see popular girl Sue Snell (Wilde) take some pity on her and gym teacher Ms. Desjardin (Greer) who shows Carrie some kindness. After everything calms down, Carrie is told that her mother is coming to pick her up and we see that besides being put on the spot, she’s afraid of her mother. We don’t blame Carrie for being afraid of her mother. Her mother runs a very strict house, so to speak. She’s very religious and will at times quotes things from the bible (sort of) to Carrie because she’s “misbehaving.” She’ll be even punish herself sometimes to make Carrie stop. Needless to say, she’s a bit unstable. Moore does do a good job of playing up Margaret. She is subtly frightening and fierce and there is an interesting addition to her character that I kind of wanted to see more of. But, on the other end she can show that she truly loves her daughter and wants to protect her but when she turns on her it makes us look at her differently. But let’s not forgot, this movie belongs to Chloe Grace Moretz playing our title character. Many believe Moretz was miscast or even saying that they can’t see why they cast Moretz because she’s to pretty to play someone who in the book is not pretty. I don’t think that any of that really matters. 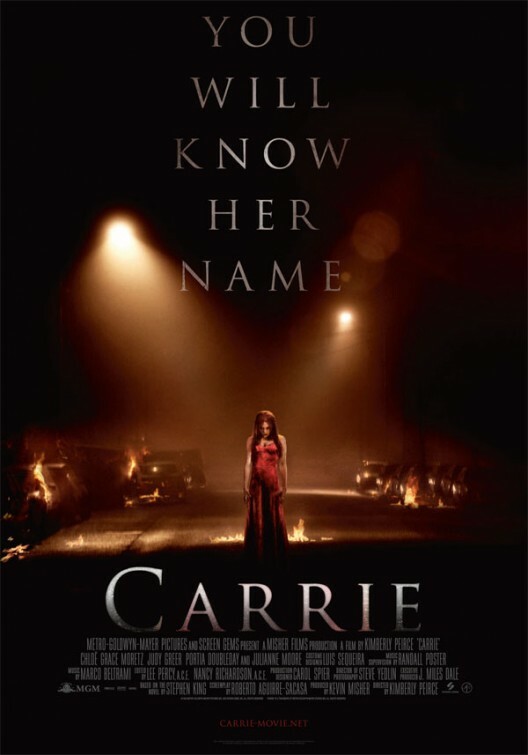 Without sounding like most of the pervs out there, Moretz is pretty but it’s her acting that makes her Carrie. Her performance as someone who has been raised in such a horrific, abusive home by her mother is what makes her so uncomfortable in her own skin and withdrawn around her classmates. Some of her strongest moments are when she’s acting across from Moore, especially the final scene, and as Carrie tries to stand up to Margaret and gaining more self-confidence her powers get stronger. The rest of the cast do their parts as well as they could. Greer as Ms. Desjardin who plays Carrie’s protector and even tries to cheer Carrie up does okay in the small role she has. Wilde and Ansel Elgort are likeable as the school’s it couple, Sue and Tommy, who decide to do something positive for Carrie, after Sue can’t get past her guilt over joining in on the cruel incident with Carrie, so you kind of feel for them at the end. Of course everything leads up to the infamous prom scene. It’s still a bit disconcerting to see Carrie having a good time at prom only to know she going to have pig’s blood dumped on her. It’s there of course where everyone that’s made fun or laughed at her learn what happens when you push someone to far. Carrie taking out her classmates is a bit terrifying especially when you see she’s kind of enjoying it and doesn’t care who’s in her way. All in all, Carrie isn’t a bad movie. There are some standout moments and the acting from Moretz and Moore is top notch. However, the movie never really reaches it’s full potential even with the pay off prom scene. Again, there’s nothing wrong with the movie but for my only original movie comment, some of this has been done before. I’ve said this before and I’ll say it again, making movies off true events is always hard. Not just because everyone (or mostly everyone) knows the story, but because filmmakers have to make the audience forget that what they’re watching didn’t happen. Needless to say, audiences have to suspend their disbelief in these kind of movies even more. However, every now and then a movie like this comes along where everything above comes up, but you find yourself wondering or waiting to see what’s going to happen next. Captain Phillips tells the true story behind the 2009 Somali pirate siege of Captain Richard Phillips’ ship, the Maersk Alabama, and what happened when Phillips was with the pirates before he was saved by SEAL snipers. The movie does make the danger feel real and tense. The takeover of the ship is drawn out and we see how Phillips and his crew try to keep them from boarding. We see the fear and desperation, especially when they finally board. Its Phillips however that keeps his calm more than others. He makes sure his crew goes and hides while he deals with the pirates on his own. Phillips here isn’t a hero per say, he doesn’t have a gun or weapon. Instead its his words are the only thing he has to keep his crew and once he’s captured himself and Tom Hanks’ performance proves this point. 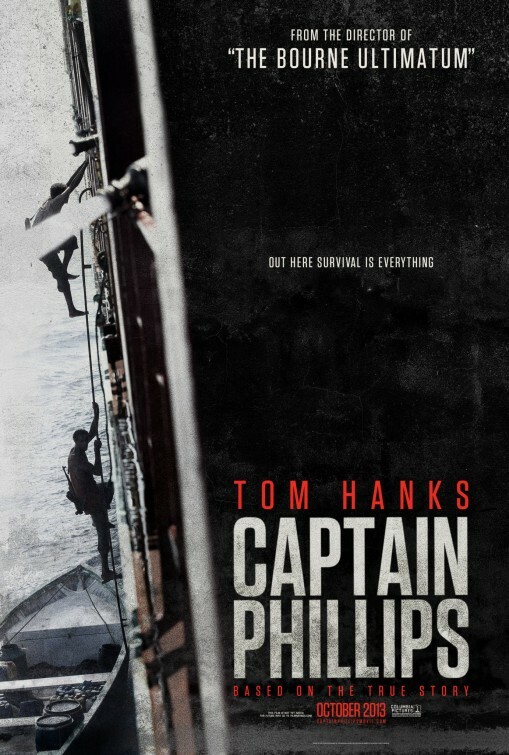 Despite this being based on a real event, and not to take away anything from that terrible event either, the performances by Tom Hanks and newcomer Barkhad Abdi, who plays the Somali captain Muse make the top notch. Hanks plays all the ranges here, buying time with the pirates while secretively dictating directions to his team via intercom and then is scared out of his mind. However, his best performance comes at the end of the movie when everything sinks in. Abdi does most of his acting through body language and his eyes and when you finally learn more about his character it really depends on the view if you feel a bit sympathetic for him or not. Of course everything leads up to the end sequence; Phillips, the pirates, a Naval fleet, and a SEAL Team squad, all together in one small section of sea. Director Paul Greengrass jumps from wide shots of the entire situation to the extreme close ups of the entire cast. The tension is a at max and even though we know what’s coming we’re at the edge of your seat. All in all, Captain Phillips is a drama and tension filled thriller about an incredible situation and about a man that wasn’t trying to be a hero but was doing things by the book. Who knew that a fake trailer in Grindhouse would lead to an actual movie, I’m sorry movies. Robert Rodriguez comes back to direct this more over-the-top and ridiculous, and I do mean that, installment to his now famous Machete character. Unlike the first movie Machete Kills tries to hide its social commentary a little more and instead just wants to you enjoy the ride. Also, in a fun little twist the movie kicks off with a fake trailer that seems like nothing at first but pay attention and you’ll see how important it is. Machete gets summoned to the White House by the President himself, played by Carlos Eztevez aka Charlie Sheen, to stop a Mexican revolutionary that has lost his mind, turned terrorist, and has a missile aimed directly at Washington. Of course, Machete is the only man who can save world. He makes his way to Acapulco, causes chaos, kills a few ton of bad guys and finds out there’s a lot more going on than what he thought. Sheen surprisingly doesn’t go over the top playing the President as one might expect but he sure is enjoying himself; even casting a certain someone playing one of his top secret service agents. The rest of the cameo cast also had their moments, Walton Goggins, Cuba Gooding Jr., Antonio Banderas and Lady Gaga play their very small roles well enough but they never really amount to anything other than a cool concept. Mel Gibson plays are main bad guy, for the first time in his career, Voz who is a billionaire that may be a little to into science fiction and may, and does, come off as a bit mad. Gibson even kind of pokes fun at himself here and there which is nice to see. But as with the first Machete, the film belongs to Danny Trejo. As ever he’s a man of few words, but Trejo doesn’t need dialogue to convey his meaning; his eyes hugely expressive – most notably during a scene in which he’s hanging from a noose – and his actions oftentimes speaking louder than words for this larger-than-life character. Of course like almost every Rodriguez movie the tones jump around which some will find a bit annoying but it keeps everyone on their toes and does slow the movie down just a bit. That being said, when you finally get to the third act it just feels like its run out of steam but also changes the genre completely. Is it for the better? Well that for you to decide. Some might feel a bit cheated by the ending but considering what Rodriguez did in the beginning in the movie and even saying he wanted to make this a trilogy (in the first movie!) people shouldn’t be surprised. All in all, Machete Kills is a little more “silly” (the two movies are suppose to be) than the first and maybe for the better. With over-the-top action, humor, and a pretty big cast Machete Kills is just one of those movies you need to sit back and enjoy the ride. Early on we get to know a bit about how Kowalski and Stone deal with stressful situations. When the debris hit, Kowalski does his best to make sure Stone doesn’t freak out and lose her oxygen. Stone, on the other hand, does freak out but there is a lot more under the surface (that we do find out) that changes her character and plays a major role later on. However, don’t be fooled, this is a Sandra Bullock movie. Her performance carries the movie and she does a tremendous job and for me one scene stands out in particular (it’s near the end). Clooney’s Kowalski is this charming and maybe somewhat cocky but he knows what he’s doing so you can’t blame him. But, as much as Bullock carries the movie you can’t forget about the people behind the camera. And I’m not just talking about director Alfonso Cuaron, I’m also talking about Steven Price’s score that fits so perfectly with the movie, Emmaanuel Lubezki’s cinematography and the whole Special Effects crew. 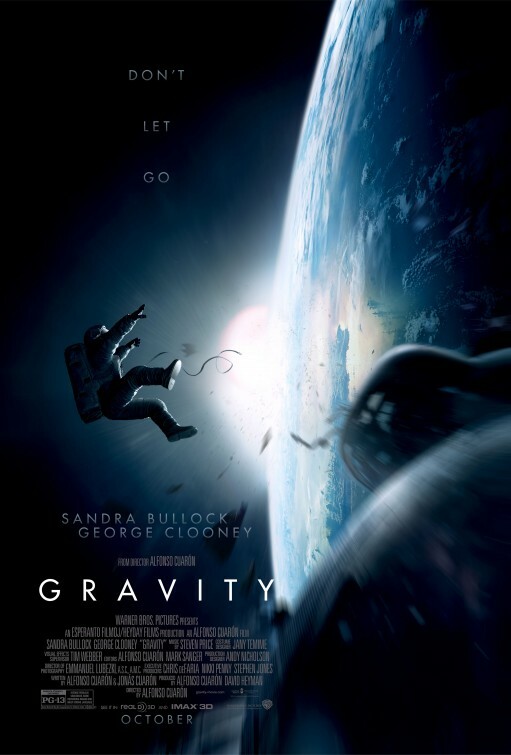 The whole movie takes place in space and with zero gravity. You might be thinking “how the hell did they pull this off?” The answer to that is “Don’t think about it.” And you won’t because you’ll be drawn into the action. The special effects are done so well and with Cuaron’s long one takes you hardly notice. Cuaron also knows what he’s doing and nothing is done just to fill up time, everything has a purpose. Even the casting of Ed Harris (although it’s just his voice) as Houston Mission Control and, again, those long takes are just fantastic. Cuaron even puts us in the “driver’s seat” by giving us many POV shots of Stone as she’s drifting but also when everything goes wrong. But one of the things that make this movie a little more stressful is the fact the Cuaron goes with decision that many Hollywood movies don’t do, Cuaron takes away the sound in space. All in all, Gravity is an ambitious movie that somehow was pulled off. Despite its “flaws” (I’d be lying if I said there were none but they’re very, very minor) Gravity is more than just a survivor drama or thriller. It’s a lot more than I thought it would be. It asks a question that will leave you thinking after you leave the theater. More importantly it is mostly a nonstop ride and a damn great movie.